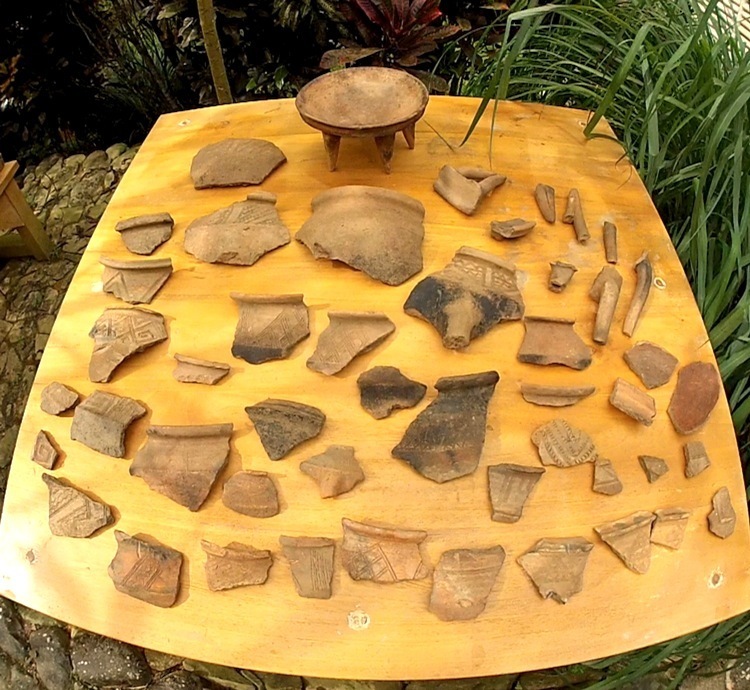 Among several hundred ceramic sherds recovered during 2014 from the surface soils on the Hummingbird Pyramid near La Maná, Ecuador are many recognizable fragments of dining plates, stilted cooking pots and stilted platters. 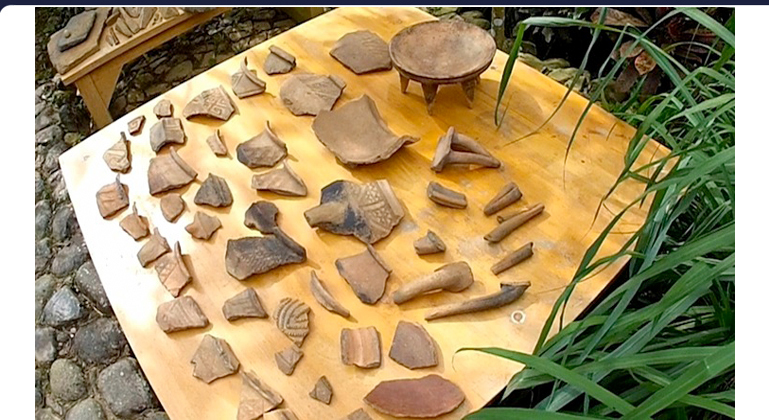 This group of exciting finds includes more than a dozen examples of small- and medium-sized cooking pots that were intricately adorned with a broad, circumscribed band of repeating hieroglyphic pictograms. The considerable hardness of these refined ceramic products is contrasted by their high porosity that results from their very high content of quartz sand and other, more exotic particulate inclusions. Particulate loading of the kaolin clay imparts the distinctive sandy coloration and a sparkling brilliance when viewed in direct sunlight, emphasizing the reflective quartz grains and a variety of metallic mineral inclusions. The high mineral content of these porous, often unglazed ceramics from atop the Hummingbird Pyramid are comparable to modern earthenware, with the exception of the presence of pulverized metallic inclusions --for which no modern or ancient equivalent has ever been documented. This earthenware is magnetic. 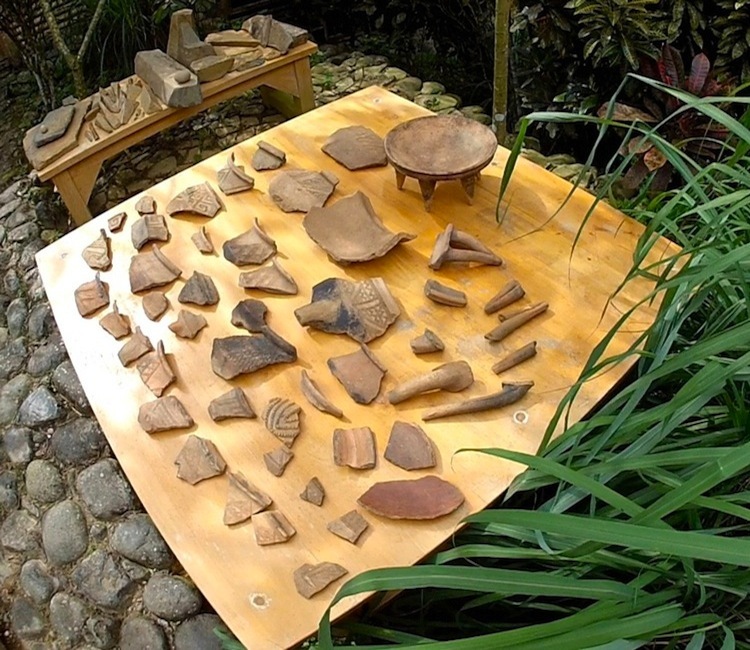 An intact example of a similar stilted platter was discovered during residential excavations near La Maná (above), and has been included to provide reference aiding visualization of the original size and stilted design configuration of cooking pots from the Hummingbird Pyramid's upper walkways. One of the more complex and beautiful examples of Paleo-Sanskrit shoulder text inscriptions decorates a small magnetic cooking pot, reading: ris ris vi ris mi-is ya ris kar , meaning "Dwindling..., from dwindling synchrony commencing dwindling works..." (above). 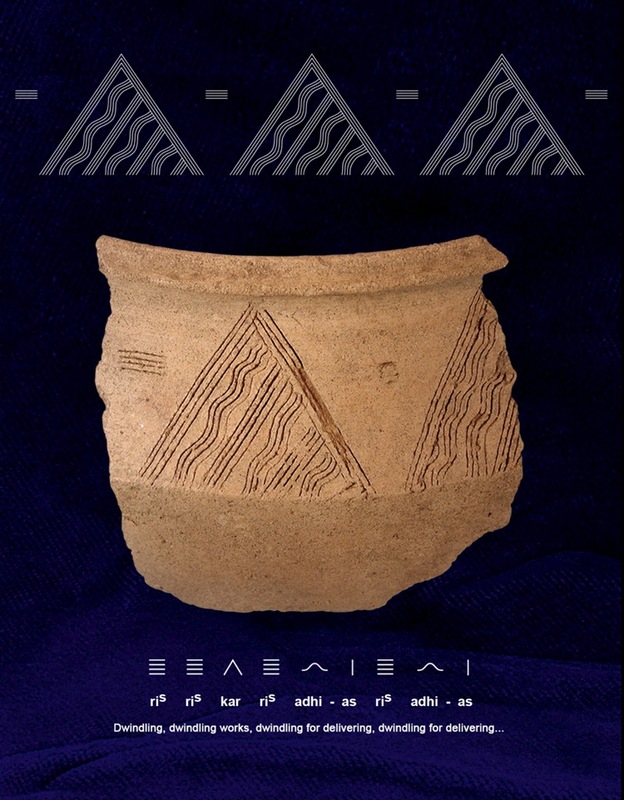 Very similar hypnotic designs with tightly nested spirals characterize ligature groups used by Paleolithic and Neolithic cultures throughout Eurasia. 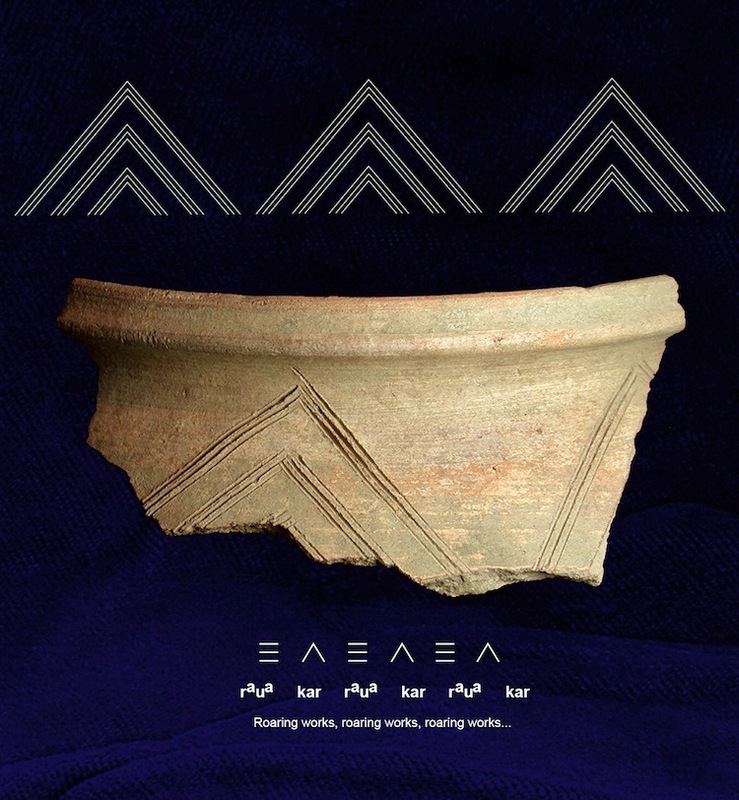 Also seen worldwide is another iconic shoulder text, once again forming a pictogram of pyramids in rows, reading: raua kar raua kar raua kar , meaning "Roaring works, roaring works, roaring works..." (above). While various pots are covered with soot from cooking fires, other pots were apparently used for mixing a geopolymer cement. The exterior of a small stilted pot bears hardened smears of this orange cement paste, suggesting the vessel was used for mixing the small quantities of cement occassionally used to repair walkways on the pyramid. 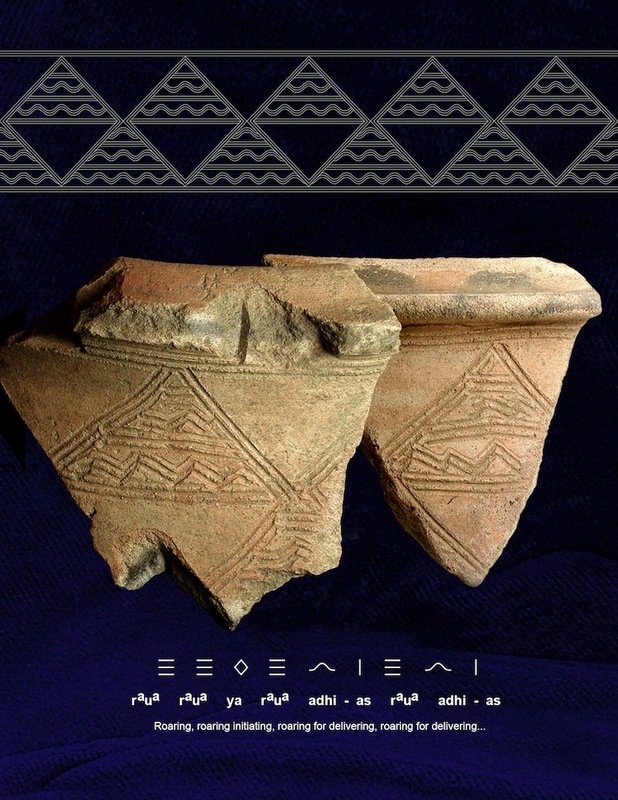 Inscribed text on the vessels sholder reads: ris ris adhi ris ris kar ris adhi , meaning "Dwindling, dwindling delivering, dwindling, dwindling works, dwindling delivering..." (above). 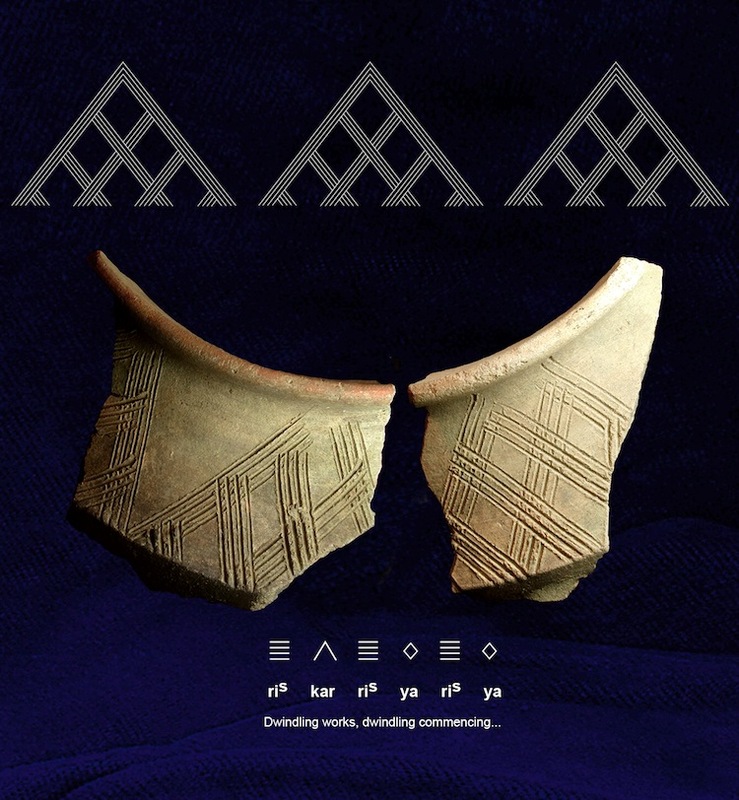 Another pictographic representation of pyramids in rows decorates the shoulder band of another small cooking pot, reading: ris kar ris ya ris ya , meaning "Dwindling works, dwindling commencing..." (above). 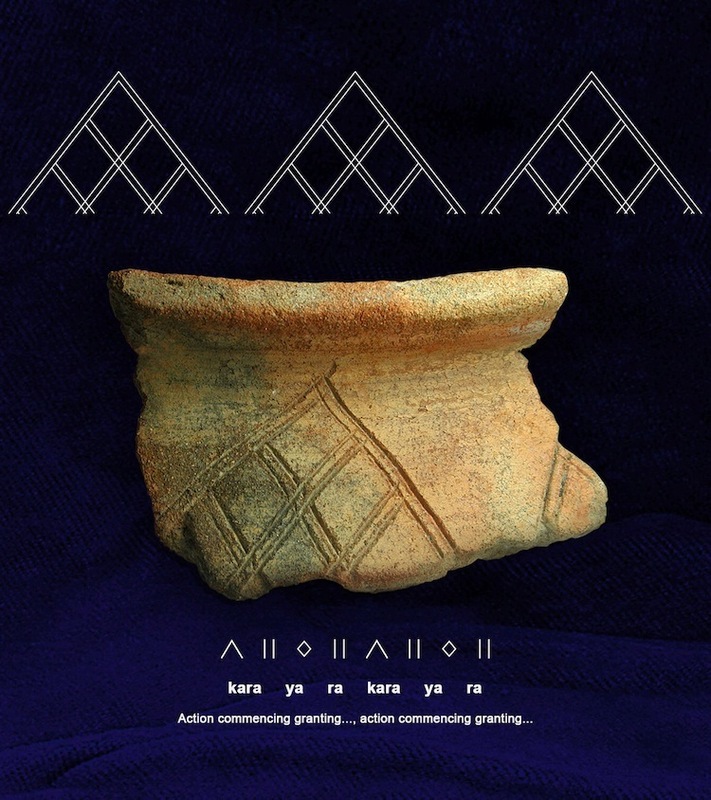 Another pot sherd was circumscribed with a band of very similar shoulder text forming a pictogram of pyramids in rows, reading: kara ya ra kara ya ra , meaning "Action commencing granting..., action commencing granting..." (above). 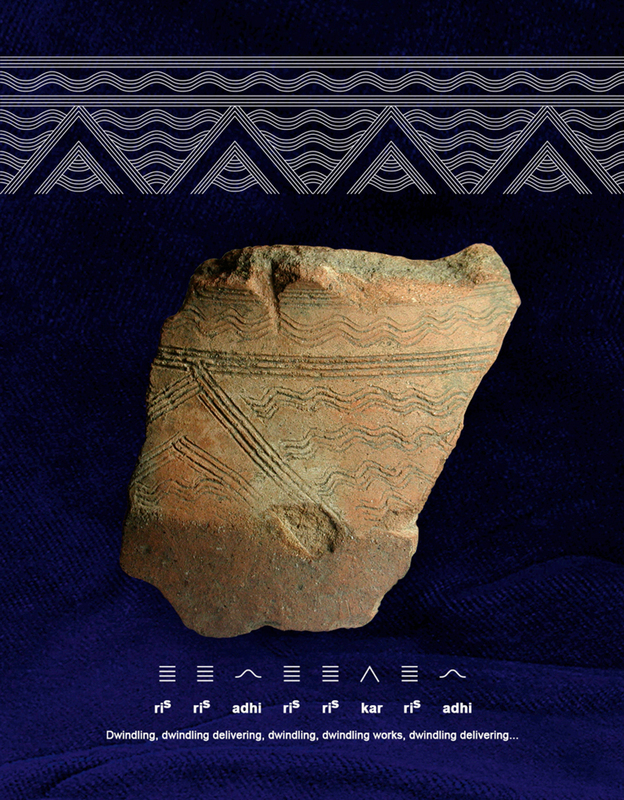 A few small fragments from a medium-sized stilted cooking pot offer inscribed rows of nested triangles representing a votive text referring to the thunderous infrasound resonance emanating from the pyramids, reading: raua raua ya raua adhi-as raua adhi-as , meaning "Roaring, roaring initiating, roaring for delivering, roaring for delivering... " (above). 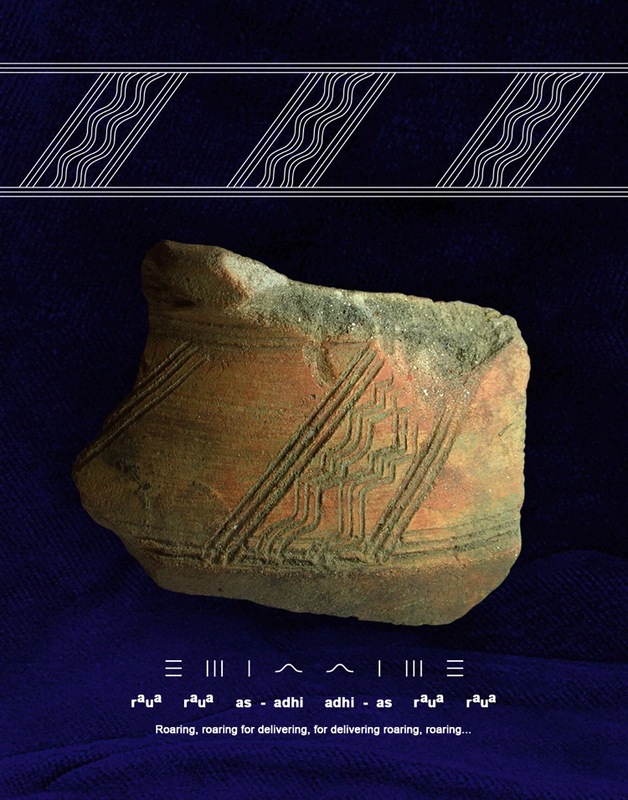 A pot fragment found on the lower slope of the Hummingbird Pyramid bears fine hieroglyphic inscriptions forming pictograms of pyramids, reading: ris ris kar ris adhi-as ris adhi-as , meaning "Dwindling, dwindling works, dwindling for delivering..." (above). Under magnification at 200x, micrographs of the sherd show an abundance of translucent quartz and black tourmaline crystals derived from crushed granites, as well as yellow iron pyrite flakes, bright white nickel filings and fine red particles of crushed laterite (above). 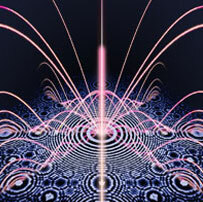 Selective admixture of magnetic metals and pyroelectric crystals in ceramics matches the constituents of pyramid geopolymer stones for endowing these materials with enhanced electromagnetic properties. 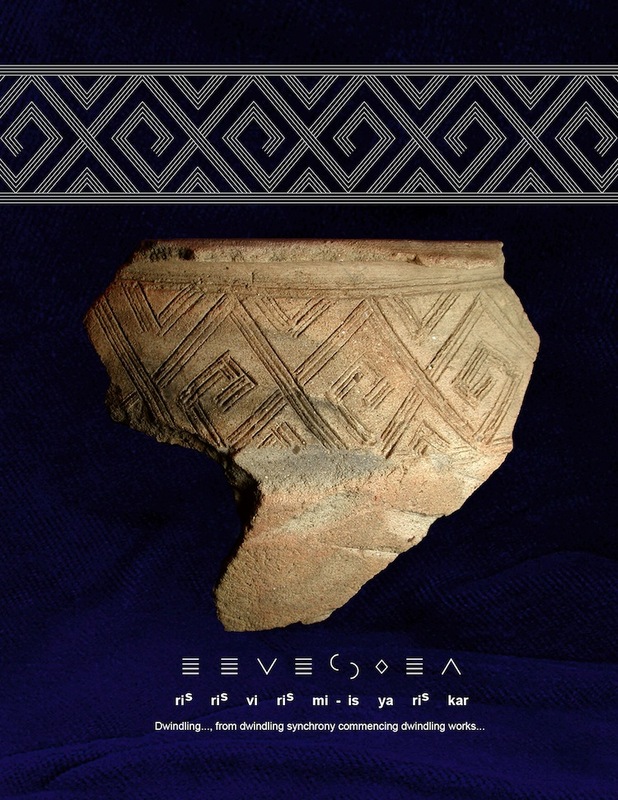 A fragment from a small pot with an orange/red exterior glaze paint was circumscribed around the same characteristic shoulder band with a palindrome reading: raua raua as-adhi adhi-as raua raua , meaning "Roaring, roaring for delivering, for delivering roaring, roaring..." (above). 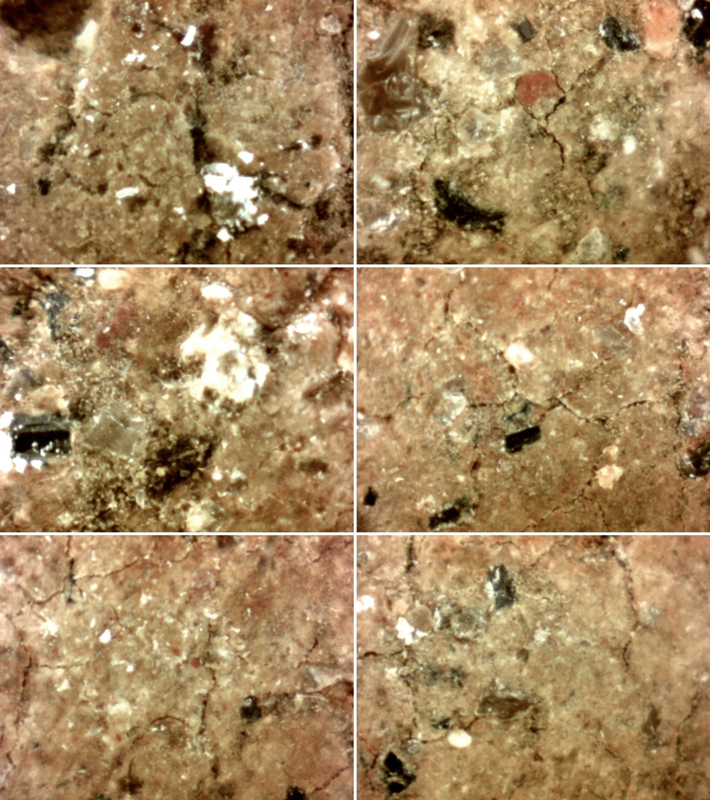 Once again, microscopy at 200x reveals an even distribution of pulverized magnetic constituents including quartz, tourmaline, pyrite, nickel and laterite. 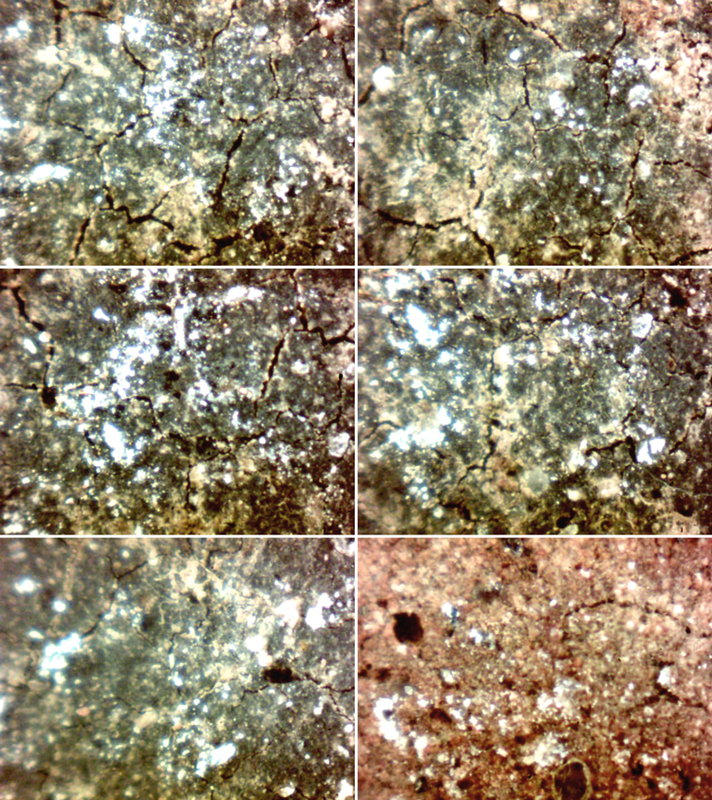 The interior surfaces of this pot sherd have been darkened by a fine carbon residue that provides contrast with bright clusters of reflective nickel and pyrite particles mixed in quantity throughout the ceramic material (above), endowing the magnetic properties of a semiconductor.